Spring Creek Ranch presents the 3rd Annual Celestial Cinema outdoor film series. 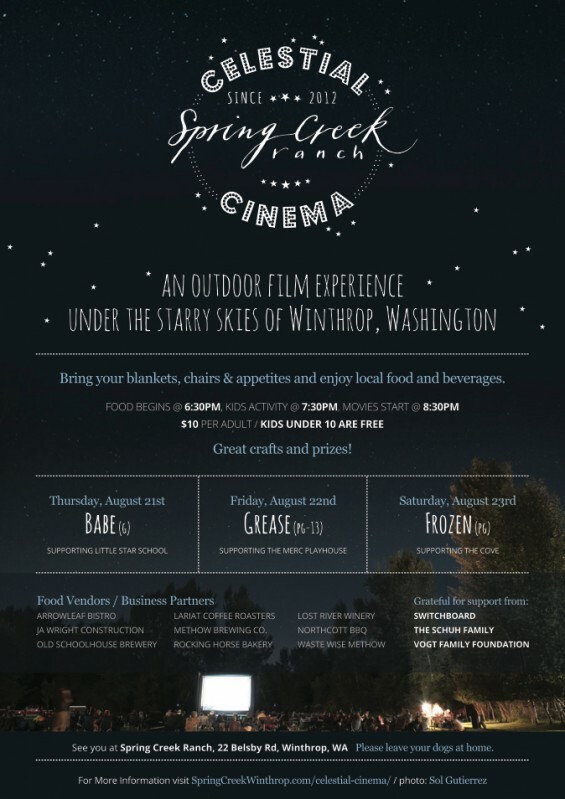 Spring Creek Ranch will again host the Celestial Cinema Film Series in the beautiful Methow Valley this August, 2014. Located in Winthrop, WA, the series offers films for all ages, al fresco dining and fun kid activities under the brilliant blanket of August stars. Celestial Cinema also features “Methow-Made” specialty foods and beverages and benefits several non-profit groups that serve the local community. Celestial Cinema will start on Thursday, August 21st with a showing of “Babe”, followed by “Grease” on Friday, August 22nd and the hit movie, “Frozen” will close the series on Saturday, August 23rd. Film Series Director Sarah Berns designed the event to benefit both the Methow’s local community and visiting community. Each family focused film event will contribute a portion of proceeds to a Methow Valley non-profit organization. This year, proceeds from the first evening (Babe) will be donated to The Little Star Montessori School, proceeds from the second evening (Grease) will be donated to The Merc Playhouse and proceeds from “Frozen” will be donated to The Cove. The timing of Celestial Cinema is excellent for outdoor film, in that August is the premier stargazing month in the Methow. August is well known for shooters, bright planets and views of constellations not seen at other times of year. Spring Creek Ranch is perfectly placed for celestial viewing with it’s wide open fields, rural location and extensive horizon. Food service starts at 6:30pm with scrumptious offerings from: The Rocking Horse Bakery, Northcott BBQ, The Arrowleaf Bistro, Lariat Coffee Roasters with popcorn, candy- of course!